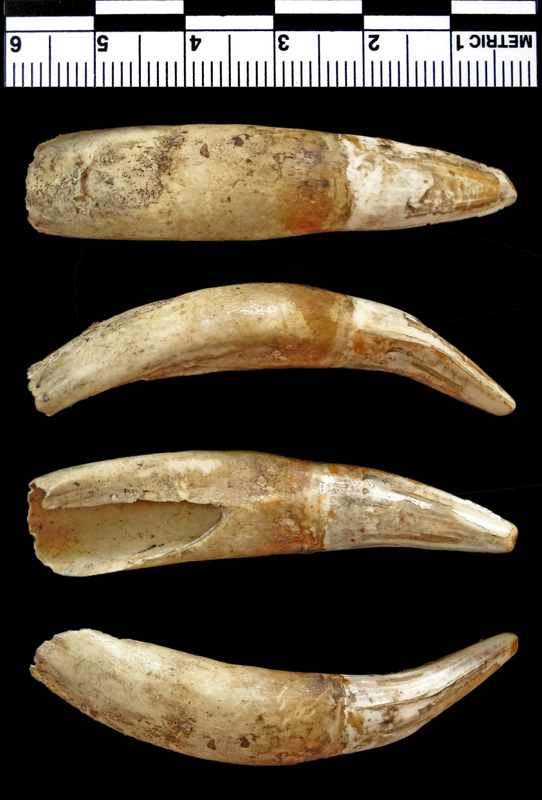 It’s the kind of thing you find in museum collections quite often, but it will commonly be misidentified – especially in anthropology collections where (in my experience) it will commonly be referred to as a claw or big cat tooth. However, nobody who commented went down that route, recognising that the hollow base and well defined crown indicates that it’s an open rooted tooth of some sort. In mammals an open root at this size that would suggest a pig tusk or perhaps a whale tooth, but this isn’t mammalian. Gharial teeth are a bit less conical than the teeth of most crocodiles and alligators. Presumably the curve helps prevent their main diet of fish from getting free when caught. Gharials are sexually dimorphic, with the adult males bearing a big rounded bony knob on the end of their rostrum, this is where the name Gharial comes from, as this feature resembles a local earthenware pot called a “ghara”. Sadly, these distinctive crocodilians are critically endangered, with just a few hundred left alive in the wild. They are affected by habitat loss, egg theft and use in traditional medicines. More mysteries next week and if you fancy hearing me talking about animals you might be interested in coming to Animal Showoff at the Grant Museum of Zoology next Thursday evening! What a brilliant skull. Looks like something out of fantasy fiction. Evolution is a marvellous thing God wot. Wow. Never would have gotten that. You continue to expand my realm of possibilities.